In sunday's finals of the CHINA OPEN 2018, the prodigy shuttler Anthony Ginting conquered the title after foiling his nemesis and World No 4, Kento Momota of Japan and no longer this can be considered as a fluke or just a major stroke of luck. Infact, this is undoubtedly the most significant victory of Ginting's career. The victory was remarkable, and he also thumped the previous three world badminton champions, sailing to the Men's Singles finals. In the inaugural round, Ginting thwarted Lin Dan after which Viktor Axelson was defeated by the Indonesian ace. In the quarterfinals, Ginting bites a bullet with Chen Long and prevailed over him. Winning against the outstanding Momota was a tough task for the underdog shuttler Ginting. In the past few major championships, Momota has been reigning the courts and defeating him is definitely an arduous task. When Ginting foiled Momota at the Asian Games, it was, in fact, a big break for the shuttler. Ginting defeated Momota at the China Open 2018 by 23-2, 21-19 in a back-breaking clash that longed for an hour. The well-balanced and nonchalant Japanese shuttler who has whitewashed many of his opponents in the major tournaments made a few errors and lost his control on the shuttler from both the ends. In both the games, Momota tried his best to maintain his dominance but failed as the Indonesian player kept delivering his flattering performance. Momota couldn't manage to play well on the slippery ground, while on the other hand, Ginting's stubbornness helped him to continue his hustle. In the opening game, Ginting was chasing the lead by Momota 14-19 whereas, in the second game, Momota was on the lead with a 10-15. In both the games, Momota was clearly prevailing but the Indonesian shuttler also flaunted his lightning-fast performance and defence skills on the court. Before this victory, the only remarkable win of Ginting in all these months was the Indonesia Masters that took place in January. "Thankful to God that I could win," said Ginting. "The match was tight and the margin was thin. I just tried to do what I did in previous matches when I was trailing. I just kept my focus, aiming to get the next point. The drift was a problem and I had to readjust in the second game. I kept the pressure on him with my attack whenever possible." Ginting said, as quoted in the bwf news. In the Women's Singles, the most prominent and amazing shuttler Carolina Marin won the second title in two weeks with Japan Open as her recent title. The local Chen Yufei was as stunning as any other female shuttler but she couldn't manage to overthrow Marin and surrendered at 18-21, 13-21. The Chinese shuttler made a few mistakes and Marin took full advantage of all the loopholes of her opponent and didn't give Yufei any space and stamped her dominance for the second time, this month. Although, Yufei was leading in the inaugural game and she was strong at 12-5, the Spaniard player her usual attacking shots and Yufei failed to handle them all; struggled to regain her lead and her efforts went in vain losing with 18-21. In the second game. Yufei tried to make a strong comeback and she took the lead, but again failed in front of the precision and attacking games. Marin took 12 points in a row and won the match and her third major title of the year 2018. "My performance here was not 100 per cent, but I'm am happy that I played ten matches in two weeks and won both titles," said Marin as quoted in the bwf news. "Today was tough because she was playing really well at the beginning of both games, and with the home crowd supporting her, she was more confident. I tried to keep my focus, tried to keep going and just enjoy the game. I kept pushing her, I wanted to show that I want to win here." She stated. In the Women's Doubles, the Japanese pair of Ayaka Takahashi and Misaki Matsutomo conquered a quick victory which was surprisingly amazing. 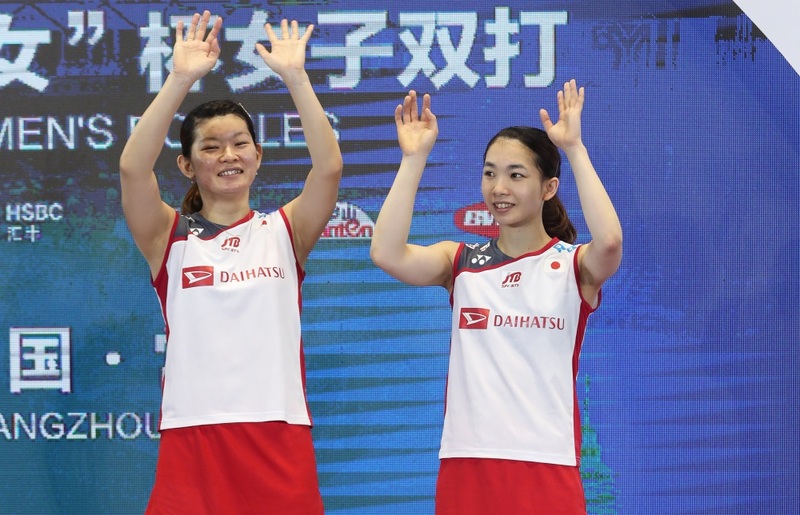 The pair beat their compatriot duo and World Champions Wakana Nagahara and Mayu Matsumoto in the decider match. After the Malaysian Open that was held in June, this was the biggest victory of the Olympic Champions. The winner pair is also senior to their young opponents. 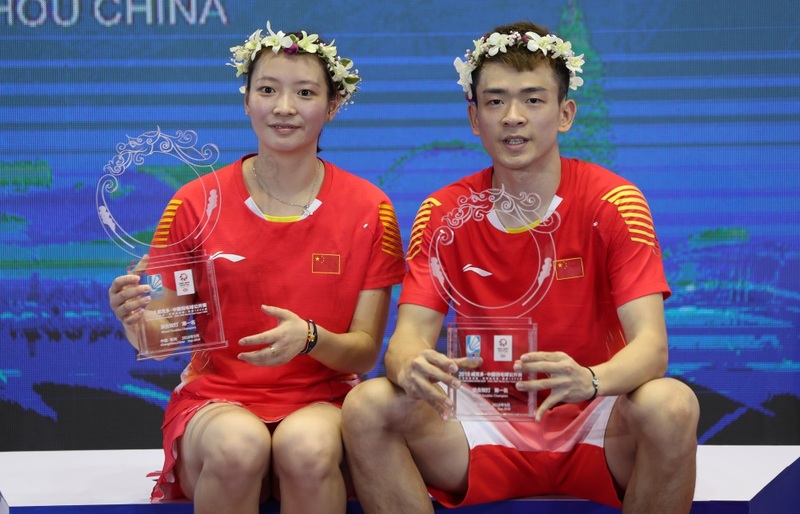 In the Mixed Doubles match, the pair of Zheng Siwei and Huang Yaqiong of China won their sixth title of this year as they hammered their Compatriot duo of Zhang Nan and Li Yinhui with a 21-16, 21-9. In November 2017, Siwei and Huang came together as a pair and it was their ninth title as a pair. Zhang Siwei stated "I'm very happy of course. We are bit tired after these four tournaments. We need to recuperate now. We need to stay balanced and try to improve. We didn't think about winning four tournaments in a row, we were just focussed on one tournament at a time,"
In the Men's Doubles, Astrup and Rasmussen of Denmark thwarted their opponents and young players Han Chengkai and Zhou Haodong of China. The Chinese pair was hustling for their first ever major tournament finals, however, they were defeated by 21-13, 17-21, 21-14. The Danish pair evaluated the capability of their opponents and fought hard in the decider game, after losing in the second game. In the game, the Chinese duo levelled up their game from 7-15 to 12-15 in just a few minutes but because of the lack of experience, they couldn't work it out and the arduous match was concluded in 52 minutes. "Both of us are quite surprised," said Rasmussen. "It sounds like a cliché, but we're surprised that we won the China Open because it is one of the biggest tournaments. We came as the eighth seeds, and we beat pairs that we'd lost to before. And we've never been in such a big final before." As quoted in the bwf news. "I'm a bit speechless," added Astrup. "There were nerves today, it was stressful. You could tell it was their first big final. But we managed to stay almost cool. I'm overwhelmed." Astrup also conveyed wishes to Men's Singles World No.4 Lee Chong Wei, who is recovering from an illness: "I want to say our thoughts are with Lee Chong Wei and his family right now. We pray for him to recover."